I received this from Hodder & Stoughton in exchange for an honest review. As always, my reviews are fair and non-bias. Darrow is a Red, a member of the lowest caste in the color-coded society of the future. Like his fellow Reds, he works all day, believing that he and his people are making the surface of Mars livable for future generations. Yet he spends his life willingly, knowing that his blood and sweat will one day result in a better world for his children. But Darrow and his kind have been betrayed. Soon he discovers that humanity reached the surface generations ago. Vast cities and sprawling parks spread across the planet. Darrow-- and Reds like him-- are nothing more than slaves to a decadent ruling class. Inspired by a longing for justice, and driven by the memory of lost love, Darrow sacrifices everything to infiltrate the legendary Institute, a proving ground for the dominant Gold caste, where the next generation of humanity' s overlords struggle for power. He will be forced to compete for his life and the very future of civilization against the best and most brutal of Society' s ruling class. There, he will stop at nothing to bring down his enemies . . . even if it means he has to become one of them to do so. This book definitely intrigued me right from it's synopsis. I'm a HUGE dystopian fan, so I'm always looking out for new ones in the genre - and Red Rising looked like it fitted everything I look for in my dystopia literature. Dystopian books seem to be literally everywhere at the moment with all the success of YA books turned-to-film like Hunger Games, The Maze Runner and Divergent, and I won't be the only one to say how I would immediately go and see Red Rising on the big screen. Darrow, our main character, is a Red, a helldiver - an extremely dangerous type of miner on Mars, unlike the Golds, who are better than them in the society. He married his childhood sweetheart at sixteen and like all the Reds around him, he works everyday, making the surface of Mars ready for the future population to live on. He does this because ultimately, he knows it will someday benefit his future children and not just his future family, but others. It's not long before he finds out that everything he knows - and everyone around him - has been a massive lie. Mars is already habitable and has been for a very long time. Now, he is thrust into being the one to save the Reds - he must become the best Gold he can, whilst pervading their system. He has to be the best he can be - better than all the rest - to attack them from the inside of their own region. But the Golds are lethal, treacherous people, who kill or be killed. 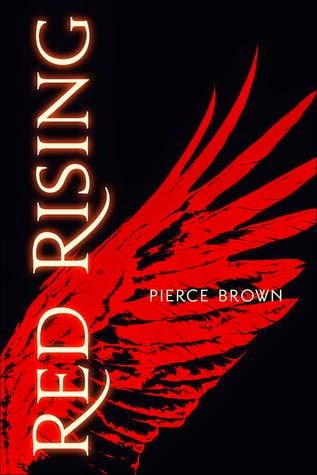 Red Rising is a thrilling ride of dark, gritty and remarkable characters and plot. Pierce Brown has created a dystopian world full of phenomenal twists and a roller-coaster of betrayal and a mystic, enigmatic tale. He created a magnificent hero of Darrow, a character that just joined my top favourites in a series - competition for Katniss and Tris! Overall, Red Rising is perfect for fans of The Hunger Games and The Maze Runner - they would join the already growing fans of the series and tear them from the shelves. This is definitely going to be the next big thing in YA literature! Fans of YA and Adult dystopia and fantasy. If you've finished The Hunger Games, Divergent and The Maze Runner, PICK THIS UP! Have you read Red Rising? Tell me in the comments, on twitter or by using the hashtag #RedRising happy reading! I haven't read this one yet. But a few weeks ago, I saw a picture of Pierce and his face. OMG. His face alone made me want to read his book (shallow much? ).